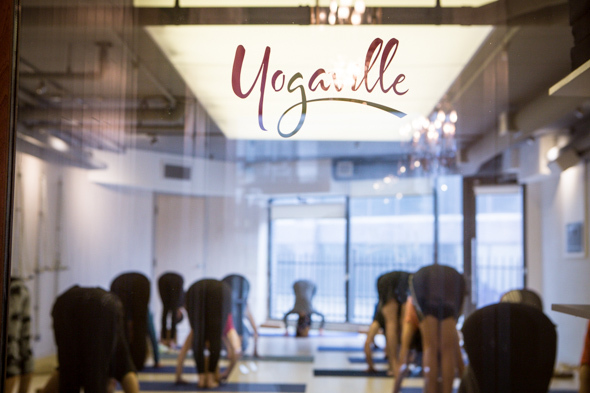 Setu Yoga Studio, a yoga studio in Leslieville, is a family run operation with a lot of heart - and very flexible bodies. 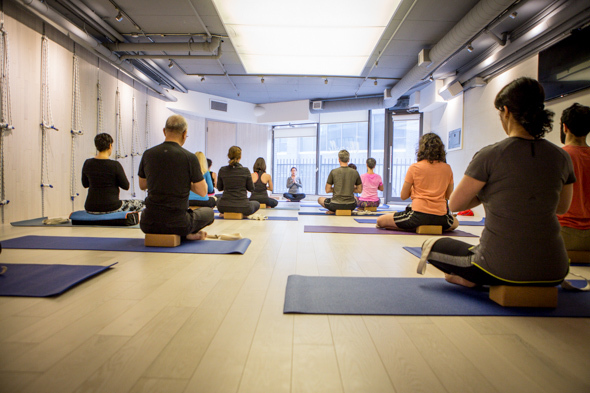 If you're big into yoga, you may have heard of Mahyar Raz, who is the founder of the Iyengar Yoga School of Toronto. Mahyar has been practicing yoga for 35 years (both in Canada and India) and holds the highest Iyengar Yoga certificate in Canada. Now, she's turned her attention toward opening Setu Yoga Studio with her son, Mazi. What makes Setu Yoga Studio so legit is the fact that the coaches have all trained and learned the yoga craft from Mahyar and are ready to pass on the knowledge to their students. "The more you know about [yoga], the more you can enjoy its benefits. It's very different from just going to a class and doing stretches, but not really knowing why you're doing it," Mazi explained. I grabbed a gal pal and headed to Setu Yoga Studio on a Thursday evening for their Repair & Restore class. 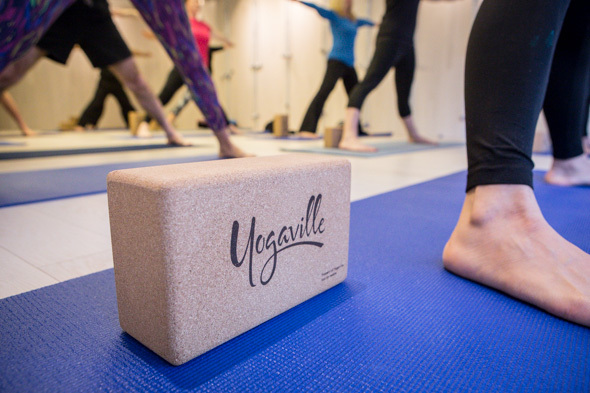 Being part of the not-so-flexible variety (seriously, ask me to touch my toes and I might be able to make it to my knees), I tried to remain optimistic that I wasn't going to stick out like a sore thumb in a room full of serious yogis. 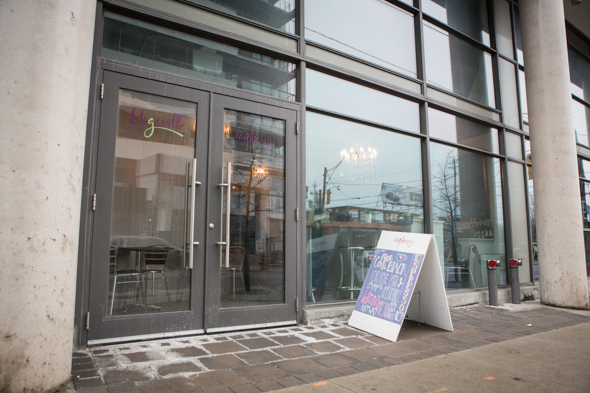 The studio is tucked under a condo building on the corner of Dundas and Carlaw. 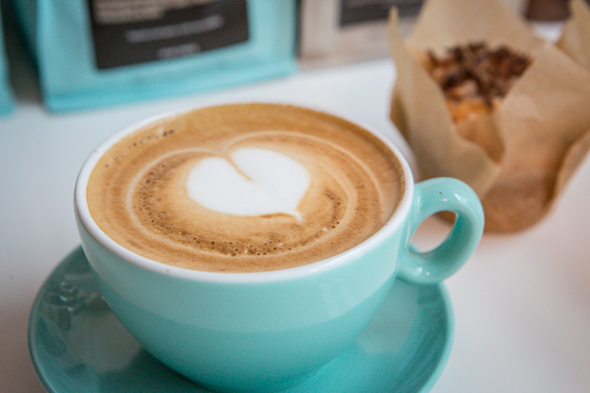 You may be confused upon finding a café where the studio should be, but have no fear - you are in fact in the right place. 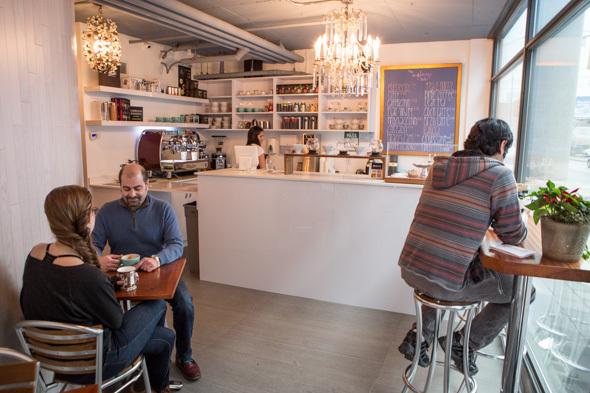 The Raspberry Cafe , owned by the same team, fronts the studio - bringing in the neighbourhood non-yogis for a hot cup of 49th Parallel espresso, brewed up on an Adonis Victoria Arduino machine. 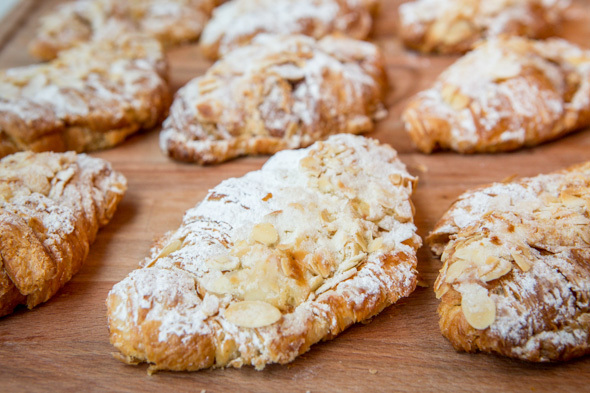 The seven-seat cafe also stocks energy-packed snacks like breakfast cookies and granola bars (and more indulgent pies by the slice) from Agouti (made by one of the store's baristas), as well as croissants from Jules Cafe Patisserie . 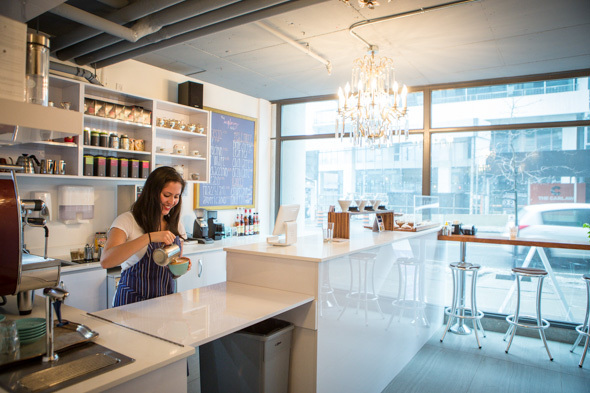 All told, the entire space is pretty small, with both the café and yoga studio being a combined 1450 sq. ft. 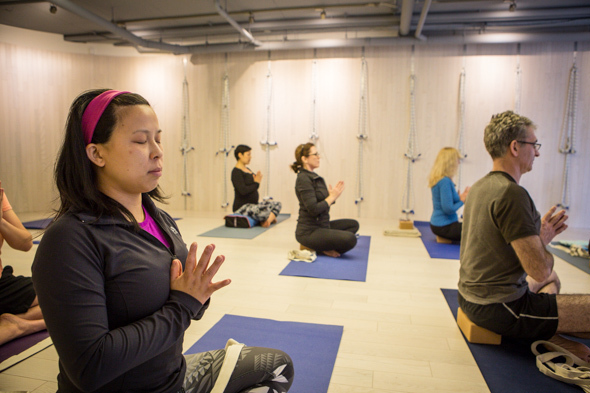 Upon entering the yoga portion of the studio, I found the change rooms were small but clean, and they had lockers with attached locks so you don't need to bring your own. The studio, too, was clean and bright. They provide you with anything you may need for the class, from mats to other various forms of cushions and equipment that will be utilized. The first thing I noticed when I walked in were the ropes hanging from the wall and was intrigued/nervous as to what they might be used for. More to come on that soon. The coach leading our class was actually Mahyar herself, but I got the feeling this session was a bit of a lesson for the fellow Setu Yoga Studio coaches, with the gym having just opened - as half the people in attendance actually worked there. The class started out really slow, and I worried that this would be the longest hour and a half of my life. We began with simple stretching moves, and I had to keep stopping to get closer to Mahyar to observe exactly how she was moving and why. That's part of the gym's mandate - they urge practicioners to learn why you do each move, instead to just following along. I assume this method wouldn't appeal to everyone - some would probably rather just get a lot of yoga in. The last half of the class picked up as the moves got a little more interesting. As most of the people in the class were well-trained, she asked us to get into a headstand position. I turned around and saw a pregnant lady on her head and thought, whoa - that's talent. For the very few of us that weren't ready (or willing) to turn upside down, this is where the scary wall ropes came in. Demonstrating on a fellow classmate, Mahyar placed her in the harness-like ropes, hooked her knees between the rope and wall and let her hang upside down. Not loving the whole blood rushing to your brain thing, I opted to do a simple downward dog type position instead. The class lasted close to two hours - which I thought was a wee bit lengthy. Afterwards I asked my friend - who has more yoga experience than I do - what she thought of the whole thing, and we pretty much had the same opinion: For such a long class, it didn't feel like we had done much, or gotten in any kind of workout. I'd be interested to see what the class is like in a few months when they're more settled (it felt like Mahyar was kinda winging it for the most part). They offer a small variety of classes (and some days, there are no classes at all). "We want this place to be an extension of one's own space. We want people to just drop in, chit-chat, get to know one another and become friends. We don't want yoga to be a chore," Mazi explained. A drop in class will set you back $17, or you can buy a 5, 10 or 15 pack of classes ranging from $75 to $195. They also offer workshops for further learning. If you want to learn the art of yoga at a slow pace in an intimate space, Setu Yoga Studio is a safe bet.